If you attended the Trauma Informed Mindfulness training, enter the Registration Code for a special discount! Many of us see clients for therapy who have abusive or traumatic histories and typically have a well-developed inner critic and shame-based sense of self. They often demonstrate a limited or total lack of ability to receive compassion from others or provide it to themselves in times of suffering or emotional challenges. Also, many caregivers, including those in the field of psychotherapy, experience empathy fatigue and have not learned immediate ways to access inner resources to mitigate this. This workshop is primarily based on the direct experience of the presenter who is both a psychotherapist and experienced teacher and practitioner of Mindfulness. It also includes the work of, among others, John Kabat Zinn and his colleagues, authors of Full Catastrophy Living and A Mindful Way Through Depression; Paul Gilbert, PHD, psychotherapist, researcher and author of Compassion Focused Therapy; Kristen Neff, PhD, a primary researcher in the area of self-compassion, author of Self Compassion; and Chris Germer, PhD author of Mindfulness and Psychotherapy. 1. Develop a basic understanding of Mindfulness, what it is and what it is not. 2. Experience at least 2 foundational Mindfulness Meditation Practices. 4. Describe key research that supports the benefits of Mindfulness and Self-compassion. 5. Experience at least 2 techniques to increase self-compassion in everyday life. 7. Identify the client profiles for those who will benefit from the understanding, experience and practice of basic Mindfulness and Self-Compassion skills. Livia Walsh is a Nurse and a licensed Psychotherapist in private practice in Encinitas, California. In her 40+years of professional practice, she pursued training in the areas of holistic/integrative health including mindfulness. She is the founder of Mindfulness For Health and Well-Being which offers programs such as, Living a Mindful and Compassionate Life. She is a certified MBSR teacher, trained at the University of Massachusetts Medical Center under the direction of Jon Kabat Zinn, Saki Santorelli and the senior teaching staff. She is a Senior Guiding Teacher and Mentor at University of California San Diego Center for Mindfulness. 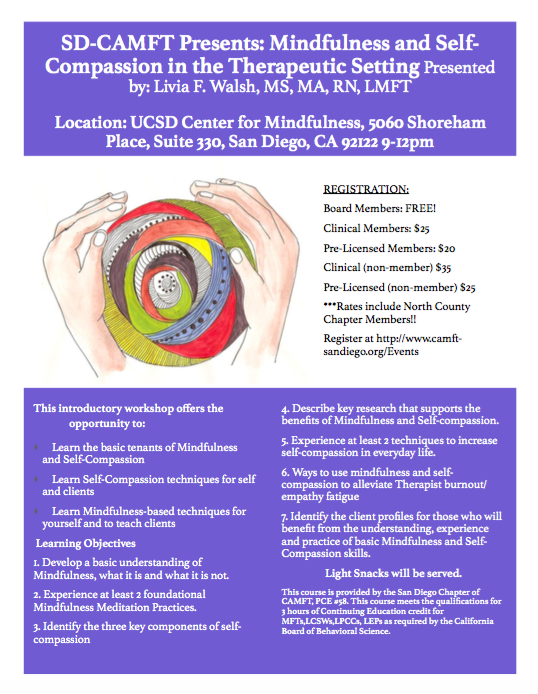 Livia is also a certified Mindfulness Self Compassion teacher at UCSD and completed her training with Kristen Neff, Chris Germer, Steve Hickman and Michelle Becker. She has integrated Mindfulness in her work as a nurse and psychotherapist with patients, students/ and interns. She teaches MBI’s to the professional and clinical staffs and interns in settings including hospice, hospitals, cancer centers, senior and community centers. She has presented Mindfulness based workshops/programs to such populations as nurses, physicians, teachers, psychotherapists and clergy. She believes strongly in the mind-body connection and in an integrative approach to attaining and sustaining optimal health and well-being.